Chicken Marbella is chicken marinated in olive oil, red wine vinegar, capers, olives, prunes, and herbs. It is baked with added brown sugar and dry white wine. Prunes are the distinctive ingredient in this famous dish. You can add extra prunes to taste better. While prunes and capers might seem like an odd combination, when cooked together with chicken they create a delectable sweet and sour, savory flavor. Marbella is in Mediterranean Spain but according to some website, the dish is a jewish-american origin. Whichever the case may be, this recipe is classic recipe you can cook in any special occasion! This Chicken Marbella recipe is a great dish adapted from the famous Silver Platters Cookbook. Not only is it easy to put together but it is also a real crowd pleaser that became a hit in the US in the 80’s. You gotta try this recipe, it’s delicious! In a large container with cover, combine the olive oil, vinegar, prunes, olives, capers and juice, bay leaves, garlic, oregano, salt and pepper. Mix it well. Once the marinade sauce are combined, add the chicken pieces into the marinade. Mix well to coat the chicken. Cover container and refrigerate overnight. Strain the marinade juice into a separate bowl and set aside the chunky pieces of capers, prunes, garlic, bay leaves for later use. Arrange the chicken in a single layer in a shallow roasting pan; Prepare a foil to cover the pan (halfway baking time). Pour in the marinade juice over over the chicken. Pour in the dry white wine (I alternatively used white grape juice with 1 tablespoon vinegar). Sprinkle the chicken with some salt and brown sugar on top and scatter evenly on top (specially on top of the chicken skin). Bake for about 50 to 60 minutes, until the thigh pieces yield clear yellow juice when pricked with a fork. Moist the chicken two or three times with the pan juices once it gets too dry on top. However, do not brush off the sugar. Once the chicken browns too fast, just cover the top with foil to prevent toasting the top. It should be just amber in color. Assembly: Once the chicken is cooked through, transfer the chicken pieces to a warm serving platter and set aside inside a warm oven (turned off). For the Sauce: Transfer and pour the pan juice into a small pot and bring it to a boil. Add in the cornstarch slurry and mix it well to thicken the sauce. Once the sauce is thick, add the dried rosemary, prunes, olives and capers, bay leaves and garlic. Continue to simmer to slightly cook the fruits. Season with a pinch of salt and pepper to taste. Turn off heat. 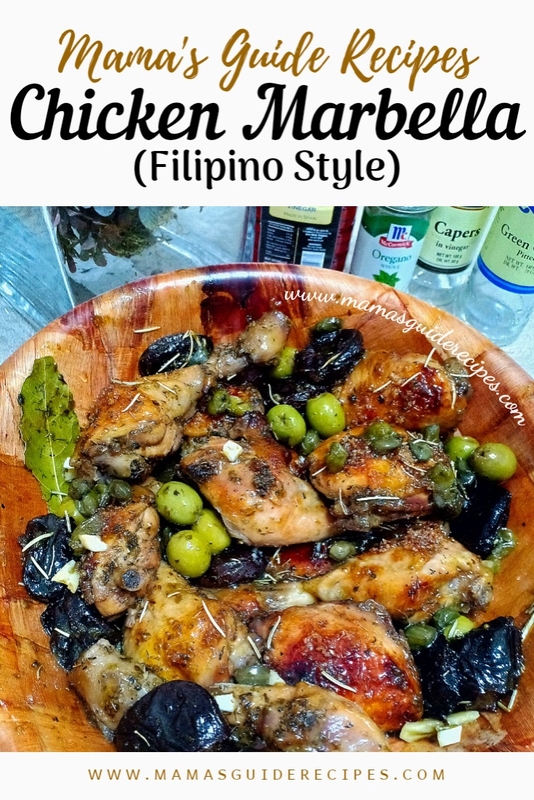 Spoon some sauce into the chicken platter together with capers, prunes, and olives. Reserve the sauce into a separate bowl if guest wants more sauce.